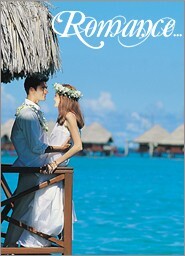 The luxurious St. Regis Resort Bora Bora offers the epitome of carefree elegance and absolute perfection. Depart today for the honeymoon of your dreams. 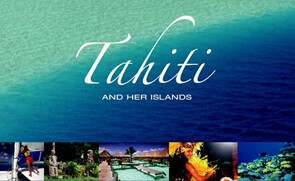 Arrive in Tahiti tonight, where you will be greeted with flower leis and a beautiful Tahitian smile. The Radisson Plaza Hotel Tahiti will welcome you for the first night with exquisite accommodations in their Deluxe Lagoon View Room. Early next day in Tahiti, enjoy a leisurely breakfast at the hotel before you board your inter-island flight to Bora Bora. In about 1 hour, you will arrive at your magical honeymoon destination. Create that special bliss in the comfort of luxury and elegance at the St. Regis Resort’s Overwater Villa. During your stay at the lavish resort, indulge in champagne right in your Villa, or go out on your private deck. Activities are included for the adventure seeker, with the shark and ray snorkeling safari and the 4×4 jeep excursion of the island. Also included is dinner at the famous Bloody Mary’s on Bora Bora – for your last night, enjoy a romantic champagne dinner under the stars. 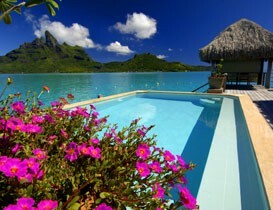 Guests can also relax on Bora Bora’s pristine beaches while capturing every essence of the opalescent lagoons. Have breakfast served on an outrigger canoe right in your very own private deck and catch the morning sun in this island paradise. Board your return flight to Tahiti late today. Tonight, depart these romantic islands aboard your non-stop Air Tahiti Nui flight, arriving in Los Angeles the next morning. *Seasonal air and land supplements apply. Ask for details at time of booking. Air fare supplements apply for Air Tahiti Nui flights on Friday and Saturday. June-October 31, high season supplement applies from $500 per person. Additional supplements and restrictions may apply over the festive season – Christmas and New Year’s. Upgrade to Air Tahiti Nui Business Class, add $2950 per person.